Home Tags Posts tagged with "football supporters"
Rival football fans in Egypt have protested over sentences handed down over riots at a match in Port Said in February 2012. The court upheld 21 death sentences and handed down prison terms to other defendants over the violence, which claimed 74 lives. Most victims were supporters of a Cairo team, and fans there criticized the sentencing for not going far enough. In Port Said, fans of the local team accused the court of unfairness. Many people believe police in the city stood by during the rioting in revenge for the role of football supporters in the unrest which toppled Hosni Mubarak as president a year before. Police deny the accusation. Ahead of Saturday’s sentencing, the army assumed policing in Port Said, which saw fresh unrest last week. Police in at least 10 of Egypt’s 29 provinces have been holding an unprecedented strike in protest at being used by the government of Islamist President Mohamed Morsi to confront protesters. 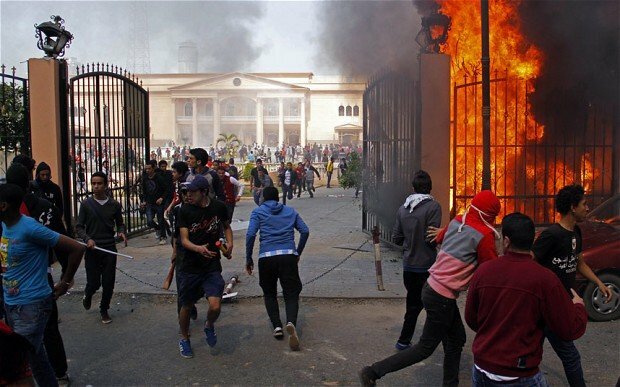 Fans had surged through the streets to attend a rally at their stadium, and a police club and the Egyptian football federation building were set alight in the chaos. Both buildings are close to the team’s stadium and a senior security official was quoted as saying by AFP news agency that some fans had stormed the club and torched it. Confirming the capital punishment sentences, Judge Sobhi Abdel-Maguid specified “the death penalty by hanging”. The court’s verdicts, broadcast live on TV, were initially cheered by fans of Cairo’s al-Ahly team, who are known as the Ultras. “First we were happy when we heard the 21 death sentences,” one fan told AFP news agency. Two demonstrators died on Saturday in Cairo in clashes with police, said the head of the city’s ambulance service. One was killed following inhalation of tear gas and the second by birdshot. The clashes, near Tahrir Square, were originally thought to be connected to the football riot trial, but it later transpired to be unrelated. Unrest in the area flared up last week when police tried to open Tahrir Square to traffic. In Port Said, fans of local team al-Masri were already angry that all of those sentenced to death were supporters of the team. Two senior police officers were jailed but seven other security officials were acquitted, fuelling local resentment. Some demonstrators tried to block the Suez Canal by untying speedboats and setting them adrift while others sought to interrupt car ferry traffic. Military police recovered five of the speedboats and brought them back to shore, but two were still drifting, one witness told Reuters news agency. However, the canal was protected by troops backed by tanks, and military helicopters hovered above the crowd. Before Saturday, the canal, a global shipping route, was considered off-limits by protesters, correspondents say. At least seven people – civilians and security officials – died earlier this week in unrest in the city. The original death sentences imposed on the 21 defendants in January sparked a local revolt. Protests continued today in capital Bucharest and other cities in Romania, the third consecutive day of street riots in the country. Demonstrations spread in Bucharest from downtown University Square to other areas in the center of the city. Riot police increased in number after a group of football supporters joined the over 1,000 people who were already in the University Square. The supporters, nicknamed “ultras”, threw flamed bottles, crackers, stones and even trash bins towards the gendarmes. Most of protesters covered their faces to avoid being recognized and fined by the authorities. Protesters in Bucharest and across Romania ask for the dismissal of Romanian president Traian Basescu, of the Government led by Emil Boc, as well as for salary and pensions raise. Some were even protesting against the Rosia Montana gold mine project. Thousands of Romanians took their anger to the streets over the week-end, with protests ending in clashes with the Police downtown Bucharest. 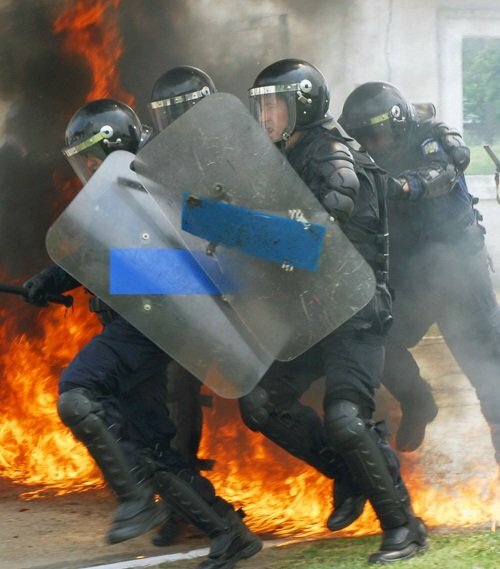 Riot police and protesters alike were injured. Over 40 people were taken into the Police custody on Saturday evening, after a heated evening in the University Square downtown Bucharest. Riot police managed to disperse protesters by firing tear gas and increasing troops on the street on Saturday evening in Bucharest. These were the most heated protests in Romania so far, after the country applied some harsh measures, such as a 25% public salary cut and an increase in VAT. The recent events show the decreasing popularity of president Traian Basescu and the Democratic Liberal Party (PDL) Government led by Emil Boc. The spark for the recent protests in the Romanian capital was the proposed health law, which, if enforced, would have brought changes to the country’s emergency health system. Sub-secretary of state Raed Arafat’s resignation from the Health Ministry over the planned changes to the system was the pretext that send Romanians protesting. Initially started mid-last week as support demonstrations for Dr. Raed Arafat, the protests soon turned against the Romanian president Traian Basescu, asking for his and the Government’s dismissal, and for early elections. Hundreds of people in other Romanian cities, as Iasi, Cluj, Timisoara joined the protests. President Traian Basescu was publicly for the changes in the health law and quarreled on TV with Dr. Raed Arafat. On Friday evening however, he publicly asked the Government to withdraw the proposal, saying it saw the public protest against it.